LONDON — Lara Croft star Iain Glen and former Emmerdale actress Amy Nuttall are to join the cast of British TV hit Downton Abbey. They are among five new faces heading to the country estate of the Crawley family when the programme returns for a second series later this year, the ITV network announced. Glen — Manfred Powell in the 2001 film Tomb Raider — has wowed television audiences more recently as Vaughn in BBC spy series Spooks. 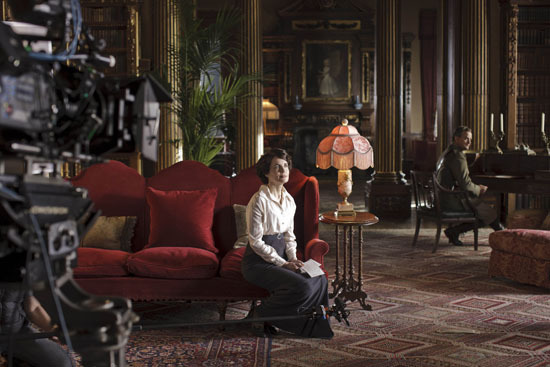 He joins the Downton cast as Sir Richard Carlisle for the return of the show, filmed at Hampshire’s Highclere Castle. Nuttall, who was Chloe Atkinson in the Dales soap for five years, will play a new housemaid, Ethel, in the ITV1 period drama, which drew more than 11 million viewers. Irish actress and singer Maria Doyle Kennedy, noted for her portrayal of Katherine of Aragon in The Tudors, will star as Vera Bates – wife of war-wounded valet John Bates, played by Brendan Coyle. Cal Macaninch – Rowan Collins in ITV1’s Wild At Heart – will play a new valet, Lang. Also joining the cast is Zoe Boyle, best known for her appearances in US motorbike gang series Sons Of Anarchy, which could help to broaden the appeal of the show even further in America. It has already drawn acclaim in the US and become the highest-rated show on the Masterpiece channel in recent years since being broadcast for the first time last month. Boyle will play new character Lavinia Swire. Work has begun on the eight-part second series to be televised in the autumn. My apologies for the tardiness, but I had to spend a few days making the screencaps because I just didn’t want to let go! Now that the first series has finished, what did you think? I hear series two (Fall 2011 for you lucky Brits, and Jan 2012 for we Americans and Canadians) will begin in 1916! Any predictions?